Looking back, it would seem that I simply loved this cake because there were mounds marshmallows on top. Every kid likes a mallow, right? But now as an adult I realize, that’s exactly why I love it. Life really is that simple. 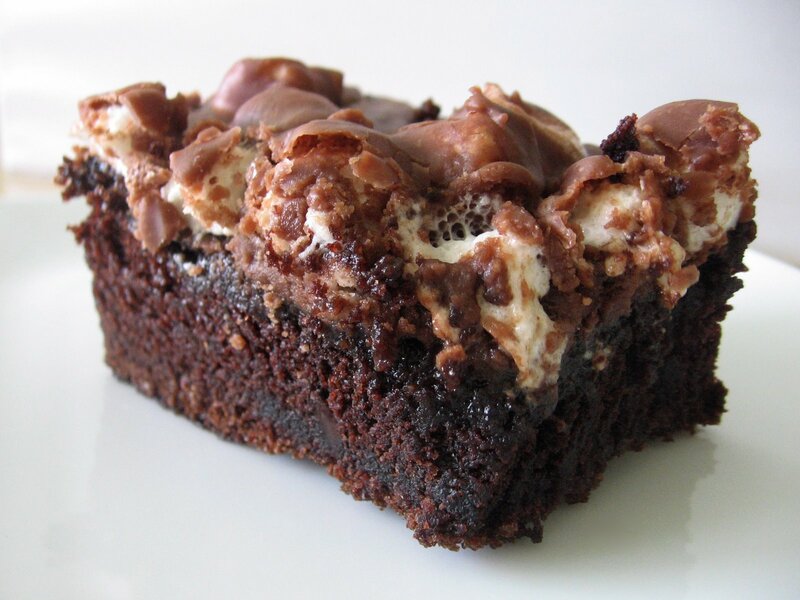 Chocolate, marshmallows, cake. YUM. The cake itself is moist, uber chocolatey. and delicious. Then pair that with slightly melted marshmallows? Down right dreamy. Well, I’m happy you asked. Here’s the recipe! Guarantee… You’ll be making this Chocolate Marshmallow Cake for years to come! Heat the oven to 350ºF and grease a 13×9 inch pan. Bring some water to boil and keep it simmering while you make the batter. In a large mixing bowl, combine the sugar, flour, cocoa, baking soda, baking powder and salt. Add the eggs, buttermilk, oil and vanilla and beat with an electric mixer for 30 seconds. Add the 1 cup boiling water and carefully stir until the water is mixed in; beat for 1 1/2 minutes. Pour the batter into the 13×9 inch pan (batter will be thin). Bake at 350ºF for 35-38 minutes or just until the top springs back when lightly touched. Make the frosting while the cake is baking. When the cake is done, pour the warm frosting over the hot cake. In a medium saucepan, combine the butter, buttermilk and cocoa. Cook, stirring constantly, just until it comes to a boil; remove the pan from the heat. Add the powdered sugar and vanilla, and beat with a wooden spoon or electric mixer until the frosting is nearly smooth (stir every few minutes while the cake finished baking). Add the marshmallows, then pour the warm frosting over the hot cake, gently spreading until it covers the cake evenly. Cool to room temperature before serving. 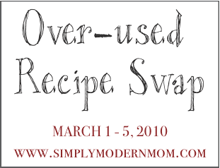 To post your over-used family recipe, click on the logo below. This looks delish I’ll have to try it. ps. Your sewing blog is also delicious. total eye candy. I so need to learn how to sew. Yum! I can see that filling my chocolate fix oh… monthly! This looks so yummy. I can’t wait to try it out! Kind of like texas sheet cake but with marshmallows. Tasty!! Amazing! Super rich, but very yummy and easy to make. Made it for the first time today since we were having company, and got rave reviews. Now this will be tempting me from atop the counter for the next few days! Yikes! thanks for giving the feedback on it. good to know! What is the texture and weight of this cake? I’m wondering if I could utilize this recipe in a tiered cake, cementing the layers together with chocolate ganache. Looks delicious! IT LOOKS GOOD(: im thinking of trying to do it sometime..
I’m going to make this cake tomorrow! Yumyum! Oh my this is sooooo sickly sweet., the cake is good but the topping needs playing with to avoid huge dental bills. I would not make it again without a big adaption. This will be 3rd birthday cake make. Great recipe the tastiest cake ever with cut up snakes or raspberries in marshmallow topping. Thank you from a dad cook! Your recipe rules!